In its latest financial results Apple witnessed its best revenue ever in the June quarter – and hit double-digit growth for the fourth consecutive quarter – with strong iPhone and ‘services’ sales, but the company’s desktop computers slumped in terms of the money they’re bringing in. In fact, as ZDNet observed, in Q3, Mac sales dropped to 3.72 million units, which is a seven-year low. That has to be a worrying statistic for Apple, and it represents a 13% slide compared to the same quarter last year. The previous two quarters, looking at them comparatively to the same time last year, pretty much held levels of sales where they were (although Q2 did drop slightly). As we’ve observed previously, looking at last year, there were certainly blips in Mac sales, but overall Apple’s desktop computers hit their highest revenue total ever in 2017. So why might computer sales be flagging now? Well, the Mac range hasn’t seen much action of late, and while Apple did wheel out a pair of refreshed MacBook Pros in July, that was too late to have an impact on the sales from Q3 (which ran up to the end of June). And, when it comes to the MacBooks, that lack of refreshes is compounded by the pricing of the notebooks. Just as we did at the end of last year, we still feel that these are an off-puttingly pricey proposition, particularly for Touch Bar-toting MacBook Pros. 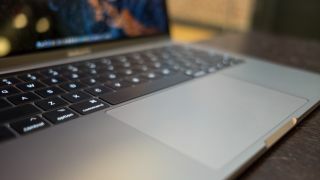 Well-publicized flaws like the MacBook keyboard woes could well have played a part here as well, and indeed it looks like the new MacBook Pro has attempted to tackle this particular bugbear with a dust-defeating membrane. Apple will certainly be hoping that the new machine helps to turn things around in the next quarter, along with other new notebooks later in the year, with a further three fresh introductions rumored to be in the pipeline, including a possible budget MacBook Air. And the latter could really help push Apple’s laptops on the pricing front, which we feel will likely be a key factor in future sales.